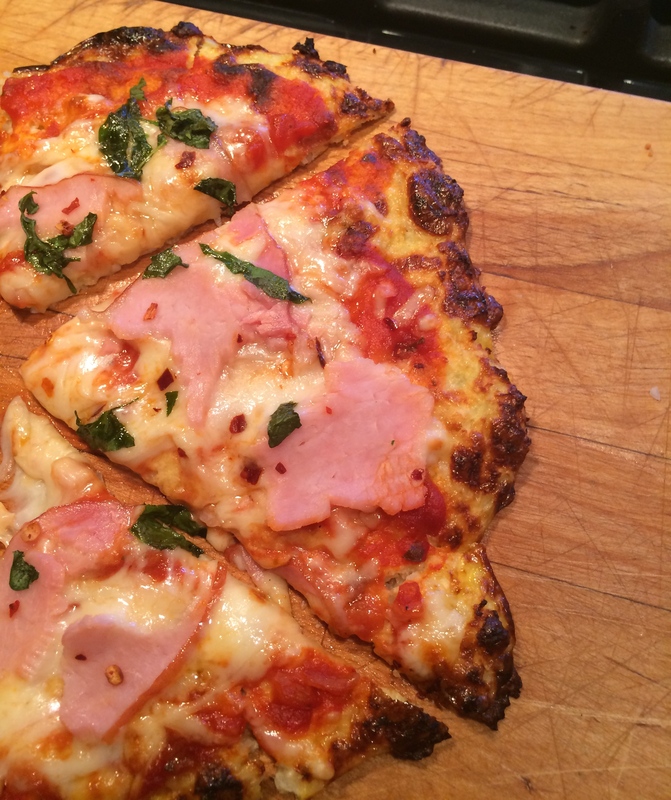 Cauliflower Crust Pizza – Healthy, EZ, Yummy! Pizza is definitely a food you learn to live without when you’re on a low carb, low potassium diet. 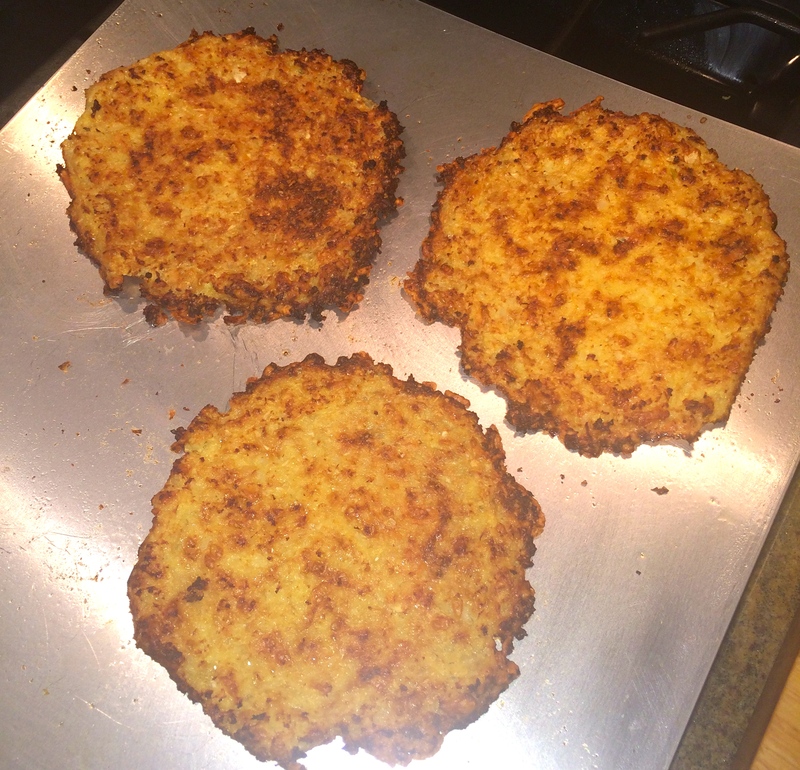 I had seen cauliflower crust recipes here and there on the web, but honestly they sounded gross, so I never tried one. But the other day, I set out to test whether a decent pizza could indeed be concocted out of cauliflower. Results – outstanding! And I just revised the recipe I posted last week to make the crust even crispier/firmer. I think I have come up with a cauliflower crust pizza that anyone would love, no matter the diet. And with careful measuring, you can keep the potassium levels down while enjoying the tomato sauce everyone else takes for granted. One thing I did discover when researching the nutrition data – while Canadian bacon is great for a low carb diet, it is not so great for managing potassium. So while my pics show Canadian bacon atop my pizza, I’d suggest that should remain a “splurge,” or every-great-once-in-a-while, pizza topping. A better topping choice would be bell peppers, and I have included that option in the nutrition data below. The directions below may look long and daunting but it’s not a difficult recipe at all! 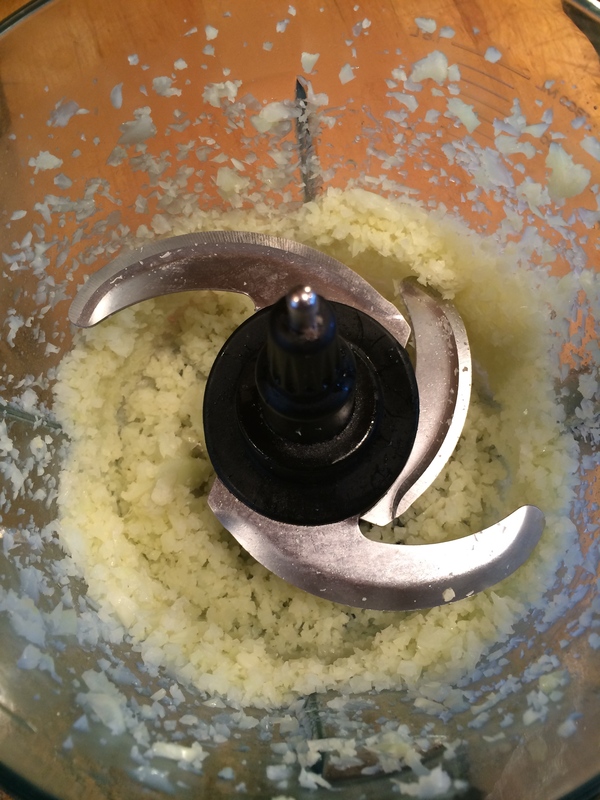 I got a little wordy because I wanted to offer several ways to prepare the cauliflower, depending on what appliances you have in your kitchen. Grate 1/2 of a cored small to medium head of cauliflower. 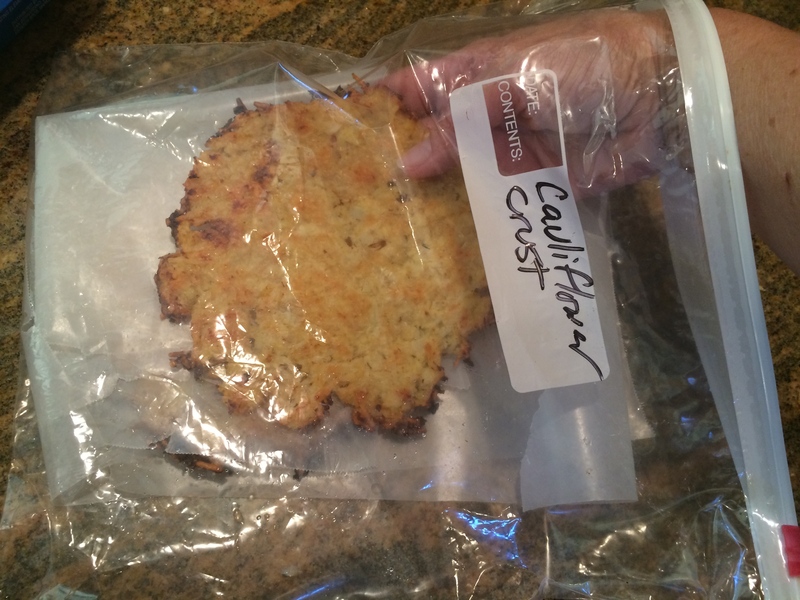 Pour grated/riced cauliflower into an unzipped baggie and microwave until soft, about 1 1/2 to 2 minutes on high. Let cool. Place a medium sized saucepan with about a half of a cup of water on medium heat until water steams. Pour shredded/riced cauliflower into the saucepan and cover, reducing heat to medium low, stirring/checking often, until cauliflower softens. Remove from heat and let cool. Note: If you microwaved the cauliflower you can skip the next step and just dump the cauliflower onto some paper towels. The cauliflower is not nearly as wet when you microwave it. Dump the cooled, cooked cauliflower into a kitchen towel, fold the towel over, and squeeze as much water out as you can. Then dump the cauliflower onto some paper towels and soak up any remaining water (you could also place the cauliflower inside a baggie with a paper towel, and refrigerate overnight, which helps to dry it out). 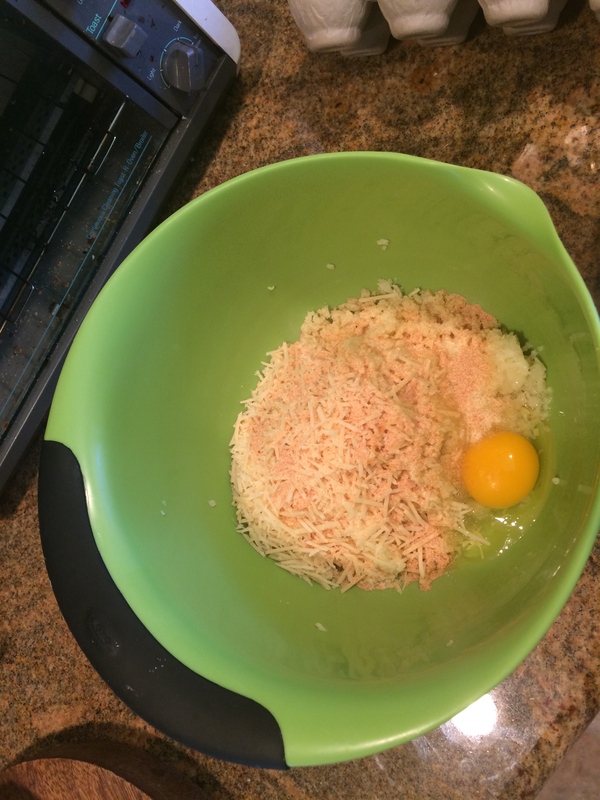 In a medium bowl, combine cauliflower, egg, parmesan, onion and garlic powders. Divide mixture into fourths and spoon onto cookie sheet. Using your hands, pat out 4 approx. 6″ circles, ensuring that mixture is evenly spread out. Bake about 15 to 20 minutes or until crusts begin to brown (use convection if you have it); then use a spatula to carefully flip crusts over. Bake an additional 5 to 10 minutes or until firm/crispy. Edges may get dark brown. 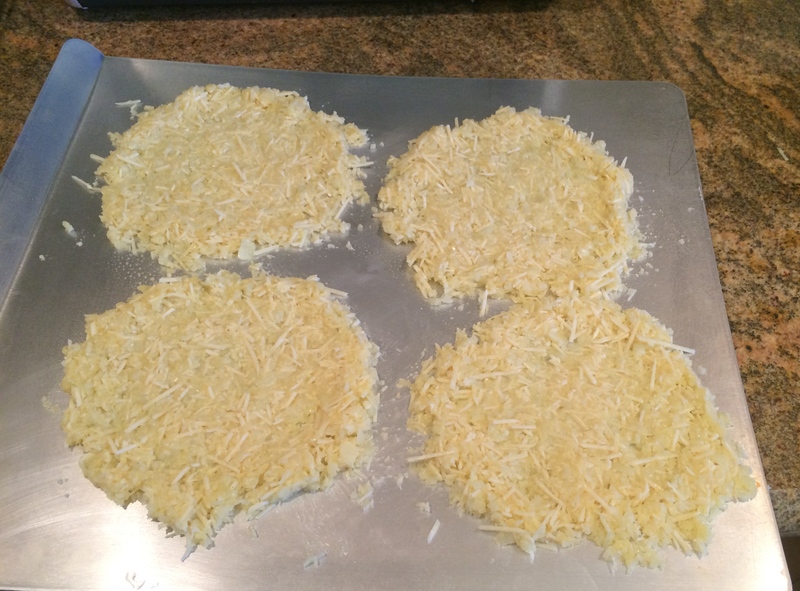 Remove crust from oven, add toppings in order listed and place under a high broiler* until cheese is bubbling. Remove and serve immediately. You can freeze the crusts by placing them between pieces of wax paper inside a freezer bag. When you want to use them, remove from freezer and lay them separately on a cookie sheet under a broiler or in a 450F oven, watching them carefully until they start to brown more deeply (about 5 to 10 min); remove from oven, add toppings and cook per directions above. 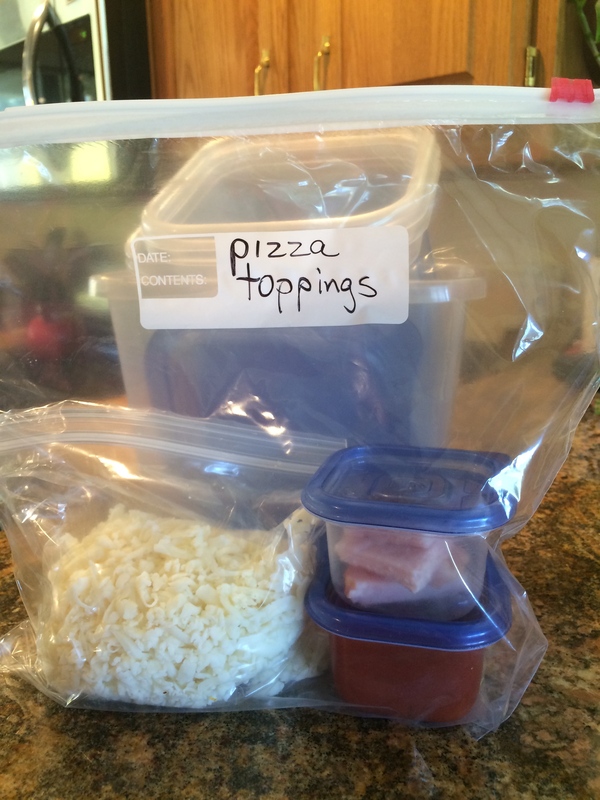 I also like to prepare a batch of measured topping ingredients and store them together in the fridge or freezer, so all the ingredients for a pizza lunch, snack or dinner are ready to go when I’m hungry and in a hurry.